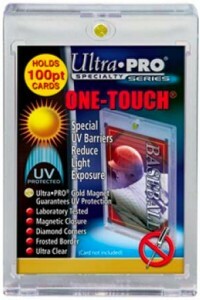 The premium Ultra Pro offering for individual card protection is their line of patented One-Touch magnetic cases. These laboratory-tested cases offer a greater overall level of protection for collectors. Ultra Pro listened to feedback from the hobby world and designed these cases to eliminate the use of screwdrivers, which was an obvious necessity for screw-down cases. 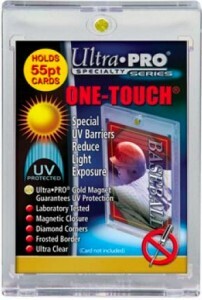 These ultra clear, Ultra Pro One-Touch magnetic cases are a great option to both protect and display your treasured cards. Beyond the standard features listed below, a new addition to the line of Ultra Pro One-Touch cases is that the actual sizing info (in card thickness PTs) is embossed directly on the case. While that does not seem like a huge thing, many collectors have likely come across a case that is not longer in the original packaging with no way to be sure the card size it holds. That can be a very frustrating experience. As seen in the image above, the specific sizing info will be found printed at the bottom of the case, near the Ultra Pro logo. Several different cases will be featured in this new batch, including a few brand new options for Ultra Pro. All of the cases that are part of the new line are each noted below along with their specific product number. Magnetic Closure - The case features a pull-out notch above the magnet that is molded into the case as opposed to a tab sticking out. This is to make it easier to stack cases of the same size. Sometimes magnets are flipped on different-sized cases and this does cause cases to literally push away from each other. The easiest way to fix this issue is to simply turn the case around and have the magnet on the other side. Ultra Pro is currently working to standardize the polarity in magnets across the entire One-Touch line. Although the magnets are already standardized for each specific case size, stacking cases of different sizes can still be an issue. 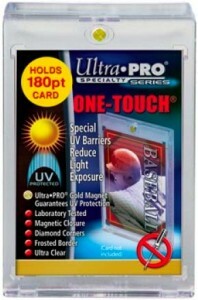 The gold magnets signify the new Ultra Pro UV-resistant version. The older-version cases use a silver magnet and do not feature UV protection. They have been discontinued. Diamond Corners - All four corners feature a diamond-shape design. This ensures that card corners are protected because they are not able to bump into anything if the card shifts. Tight Fit - These cases are meant to fit around a card like a glove. Therefore, no soft sleeve is necessary. It also provides the full-coverage protection from spills, dust or humid air. This is one area where top loaders are more susceptible to damage, since the whole top area is exposed. 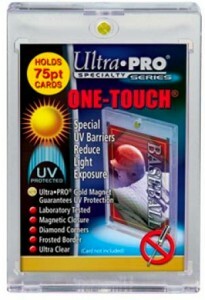 Just make sure you have the right Ultra Pro magnetic case size for the card you are trying to protect, or you may inadvertently damage the card. 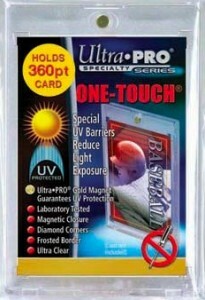 UV Protection - Special UV barriers reduce light exposure, which is particularly damaging to autographed cards. Because cards in general are susceptible to fading over time when regularly exposed to light, this a very useful feature for any high-end card. View more info in our detailed UV guide. Frosted Border - This is a simple feature but the frosted border helps draw attention to the card and not the case. 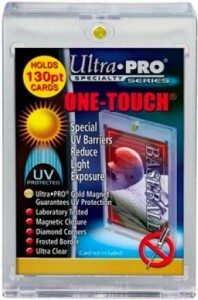 Multiple Sizes - As the thickness of cards has increased over time, Ultra Pro has expanded their product line to include many case sizes to suit each collector's needs. Case sizes are measured in points, which are based on the thickness of the card in the thousandths of an inch, or in hundredths of millimeters. One point is equal to .001 inches or .0254 millimeters So, a 35PT case holds a card that is up to .035 in/.889 mm thick; a 55PT case holds a card that is up to .055 in/1.397 mm thick, and so on. Again, it is good to mention that choosing the correct size case is very important. If the card is even a little bit over the listed size of the case, you are risking damage to the card. The card will be slightly exposed to any elements that are present and the case may open inadvertently. Plus, you will put unintended pressure on the card itself. When the card is in the case and you are placing the top on, you want to hear the snap of the two plastic pieces coming together. If it is dulled or does not make a sound, that means that case it hitting the card first and that the card is too big for the case. While collectors will find a case to suit most of their needs, there have been reports of cards that do not fit into these cases. Earlier Topps Tribute issues, specifically the base cards, have proven problematic. Ultra Pro is currently working on a "relaxed fit" case to address this problem. Each size of case is covered below with any relevant information included. There is also a helpful guide to decide what case would work best for a particular card. Simply stack as many base cards as necessary to replicate the thickness of the card in question and then refer to the listing to see which case can accommodate that amount of base cards. The standard base card is normally 20 to 30 points thick, so this is not an exact science. *2011-12 Past & Present Basketball base cards were used for the size approximation. Click on the listings or images to shop for cases on Amazon. Fits most standard base cards and autograph cards. Intended for cards up to 35PT. Fits thicker base cards and thin relic cards. Intended for 36PT to 55PT cards. Fits the thickest base cards and inserts, as well as relic cards. Meant for cards 56PT to 75PT. Fits 3 base cards (tight squeeze). Meant for cards 76PT to 100PT. Meant for cards 101PT to 130PT. 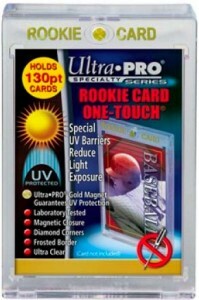 130PT UV Ultra Pro One-Touch Case w/ Magnetic Closure - "Rookie"
Special version that includes "ROOKIE CARD" in gold foil to better differentiate cases. Normally the largest case necessary for thick relic cards. Meant for cards 131PT to 180PT. Normally used to transport closed booklet cards and incredibly large relic or autograph cards. Does Ultra-pro make magnetic cases for the new Tiger Woods cards. They don’t fit in 180 point And are too big for the 360 point. Thank you. Jeff � Are you asking if there is an Ultra Pro magnetic case size between 180pt and 360pt? Currently, there is not. What cards from the TW Master Collection are you specifically referring to? I have the Exquisite rookie patch and there’s the 3 piece memorabilia patch and the card would fit in a 210pt(i’m guessing). The exquisite rookie patch and triple memorabilia cards. Jeff � Nice pull on the Exquisite patch! They are some of the best cards in the whole set. I had not realized those cards, along with the triple relic, were so thick. The only thing I can think of is to use some of the Ultra Pro tobacco card inserts as a temporary fix for the 360pt case. 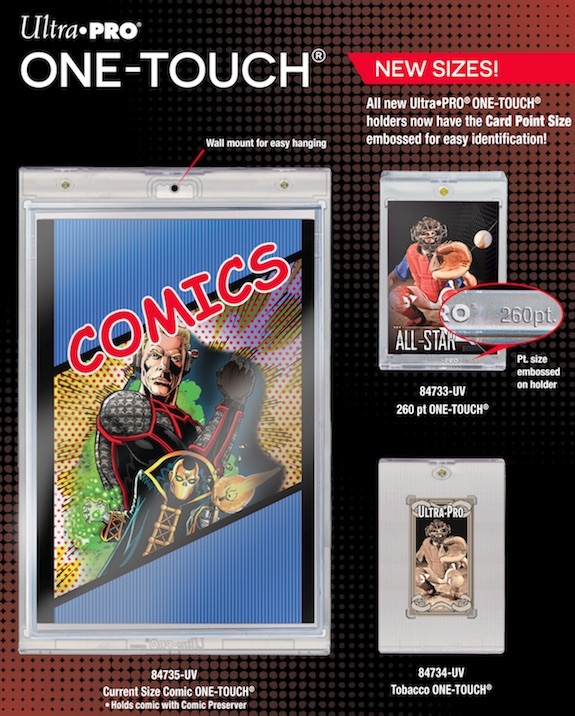 The back would be partially obscured, but at least it would keep the card from moving around in the case. Thank you very much.I was hoping to pull the Exquisite patch.I’ll get some of those Tobacco inserts. I have some 2013 Topps Inception cards. I believe these are about 2 mm in thickness. Would the 75pt Ultra-Pro Magnetic card holder fit these cards properly? Thanks. Do you know the thickness of the 2014 Topps Five Star Golden Graphs and what size holder those cards would need? Which ULTRA PRO should I use for the TOPPS 2015 Fire Rookie Autographed Patche cards? 130 PT or 180 PT, the 130 PT looks like a perfect fit but I’m concern about the autograph being damage. I was wondering if anyone knows of any product anywhere that would be similar to what 9 card pocket pages are, but something that could be used either for toploaders, or even these One-Touch cases. I realize that these would be ridiculously thick if one were to make a binder/folder, but it sure would solve the problem of cards actually laying flat in 9 pocket pages. I was wondering if there was a specific size I would need to get for Force of Will cards, as I would like to put my rulers in these. Thanks. Which magnet case do you recommend for longer vintage cards? Can you give me a specific set you are talking about? maravick card. long and tall , what do I order? help! I know there are toploaders and sleeves for the tallboy cards but I don’t recall any magnetic cases.